Give us a call and make a reservation; 781-321-7150. ​Judy is waiting to hear from you! 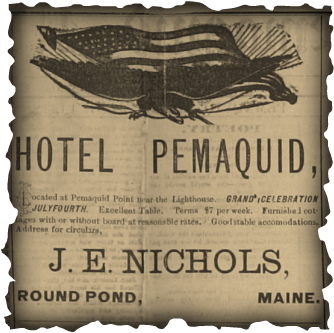 Well, ten weeks later, on July 4th, 1888, Mr. Nichols made his word stand firm, and a gala celebration was held for the opening of the new Pemaquid Point Hotel. The Bristol newspaper’s own band played, and the oration was given by Judge Oliver G. Hall, secretary and director of the Pemaquid Land Company, and great grandfather of our own Edith Hary. 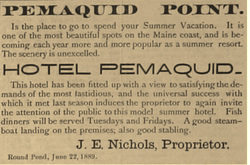 The Hotel Pemaquid was opened to guests on July 4, 1888 and still greets guests on a seasonal basis to this day. While we do not boast an ocean view from all rooms, we are located 150 yards from the restored Pemaquid Lighthouse ($3pp (8-5pm, free before 8am and after 5pm)). Our guests enjoy spending time sitting on and walking along the high rocks that line the coast of the lighthouse, strolling along Pemaquid Loop Road talking with other Pemaquid visitors while taking in the magnificent ocean views, and/or rocking on our large wrap-around porch enjoying a book; many of the attributes JE Nichols and the Pemaquid Land Trust had in mind when implementing their vision for Pemaquid Point. We are located between Boothbay Harbor to the south and Camden to the north where both of these locations are approximately 45 minutes away by car. There are a variety of restaurants in the area with the Seagull Restaurant right next to the lighthouse serving breakfast, lunch (all week) and dinner (Friday-Sunday) along with the Chart Room at the Bradley Inn serving dinner nightly (casual-formal dress required). New Harbor center (10 minutes by car) offers dine-in-the-ruff seafood restaurants and daily boat excursions to Monhegan Island. A great gift for anybody who has or does come to the hotel on a regular basis! $15 each plus $4 shipping. Designed by Kurt Adler. Purchase an ornament along with a gift certificate for a two night stay and you have an amazing gift for anybody who loves the hotel and the area! Also a great gift for the bride, groom, and their guests ​tying the knot at Pemaquid Point! ​then we would suggest getting in touch with us so that we can discuss possible dates when rooms are available. We offer a variety of rooms at reasonable prices, complimentary morning coffee, sketchy wireless internet, little to no cell service, cable on flat screen televisions, in room refrigerators, laundry facilities, and the sounds of a crashing surf and magical sunrises. We know you have a number of hotel options when you visit the Damariscotta-Bristol area and we are confident that you will come back again and again after staying with us for the value and the unbelievable location. There is no other hotel closer to the ocean and the lighthouse than the Hotel Pemaquid! ​We are a seasonal hotel opening the Thursday before Memorial Day and continuing through Columbus Day. Because of our seasonal nature, there is a limited number of rooms available for a short amount of time. We understand that circumstances may arise that prevent you from exercising your reservation and we hope you keep the seasonal nature of our business in mind if changes are necessary.